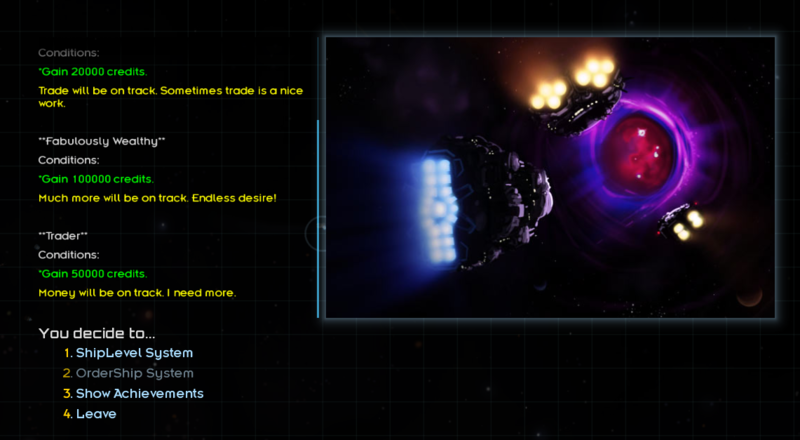 A mod that make your ships stronger and stronger. Press Ctrl+Q to call the Interaction in campaign. Use different resources to upgrade your ship. 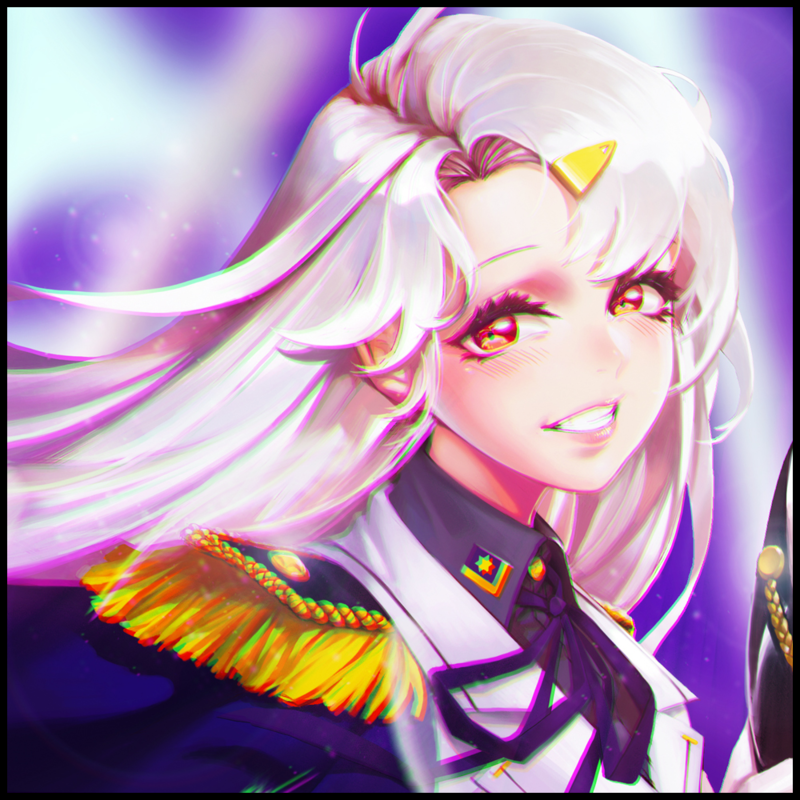 Each ship has a random quality about 0.5~1.5. It decides the cost and the degree of upgrade. Upgrade has about 40% chance of success at the minimum. You will achieve some achievements when you finish doing something like "Gain 10000 credits." Use "Show Achievements" to see the achievements you have ever got. You can see these in "data/config/achievements.csv", and players or modders can use it to add your own achievements. Just put the following code in your mod (where the achievement were achieved) after you complete your csv's editing. And, don't forget to make this code just run for one time. Update to 0.7.2a, BUT IT NEEDS TO BE TEST. Fixed the bug that quality can only affect the upgrade cost. fixed some bug and translation mistakes. This idea has been thrown around for a long time, but now it has been made! Albeit in a mod. Will try it out later when I have the time. "On average, a human has one breast and one testicle"
And to think, I was just looking for a way to do much this same thing for a faction I'm working on... except it would be turning ships into other ships or making new ones. I have finished it in 0.652a but never publish it in the forum, and I thought maybe i could post it now! Nice to see that you finally made it come out of the dark, then. Cheers to you mate! I tried a little bit in devmode, that's a pretty cool new feature. It can definitely screw with balance but i guess that''s the idea. Still, i have a few questions. I'm not sure what each upgrade precisely does before i "buy" it. Durability probably improve the armor and hull, but i'd like to know by how much with each upgrade. Also, i'm still not sure what WeaponProficiency does. Also, "flexibility" should probably be renamed as "mobility". What does the ship quality stand for? My fully upgraded Paragon got a 0.66 (rough) score while my Onslaught XIV have 1.24 (good), i'm not sure what is changing. I guess the OrderShip System is still work-in-progress, but i'm still curious to know what it is going to be. In the future, it would be cool if that feature will be available at a station rather than having to Ctrl+Q. It's not a big problem, but it feel a bit clunky. "Welcome to ExtraSystem." 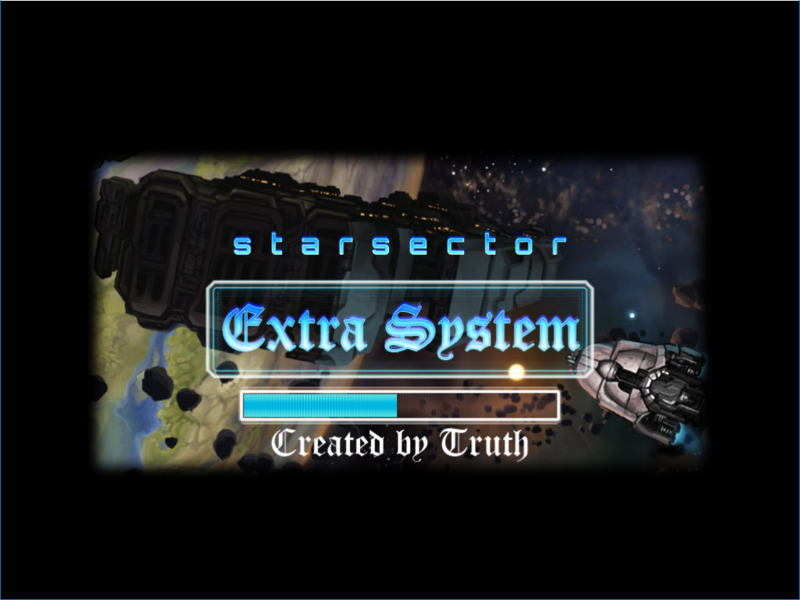 Instead of "Welcome to ExtraSystem?" "Choose the function you want." Instead of "Choose what the function you want"
"Welcome to the ShipLevel System." Instead of "Welcome to ShipLevel System"
"Resources available." Instead of "There are the resouces you have at present"
"Upgrade cost." Instead of "The resouces you have to cost on upgrade"
"100% chance of success." Instead of "100% of possibility in success"
"Congratulation, the upgrade succeeded." Instead of ""Congratulation? The upgrade succeeded." Anyway, that's a pretty interesting mod. I'll definitely use it when i'll feel like screwing around in campaign. Thanks for your correction and I will correct it soon! Next,OrderShip System will give you a chance to order ships from an abstract market that exists in the sector, and it is like expressage, spending time in delivery. 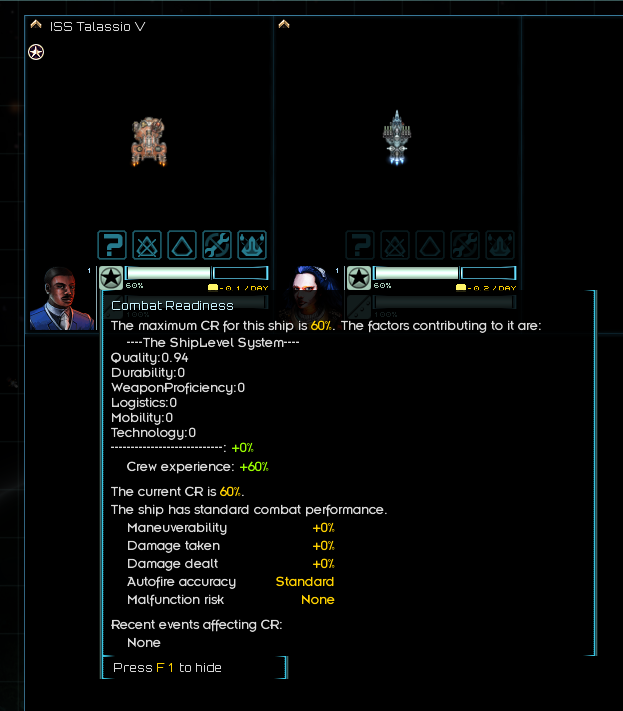 Ship quality stands for how much can the ship improve its ability.0.5 for 50%,1.0 for 100%,1.5 for 150%. Anyway, the cost is linked with ship's quality too. I use ctrl+q because i want to compatible with other mods like Nex. In this way I can avoid the inconvenience that may be made. Pretty cool feature, there's a lot of potential here. I would like it if you gave more descriptions as to what each upgrade actually does. I'm somewhat confused on what exactly weapons proficiency does. Fix and fix version updated. 1.17 fixed some bug and translation mistakes. Great! At last someone made it! Maybe it should be added extent of improvement to the list ship hullmods? 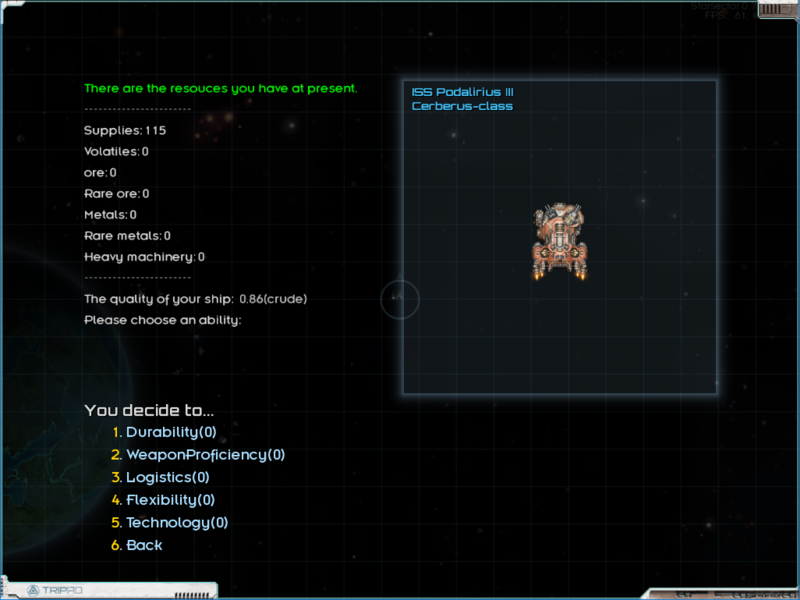 It will make possible display of new characteristics in a ship card. Would be excellent to see the ships improved in this way at NPC. It is interesting to be at war by the improved ship, but it is even more interesting to be at war against them. I think the AI makes uses of upgraded ships. I just captured a Paladin in my campaign and realized it was slightly improved already. 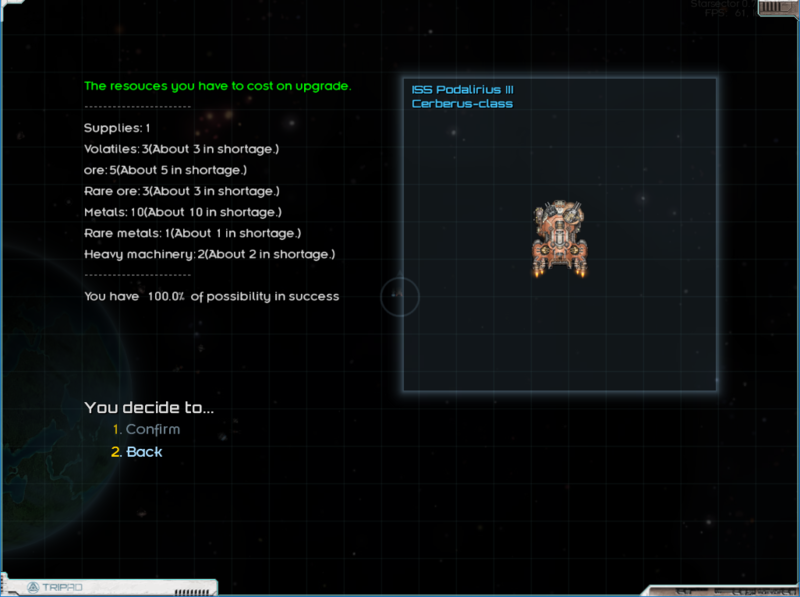 If AI ships do indeed use upgraded ships, that could be a pretty good incentive to capture over purchase. Assuming it isn't far cheaper to just buy a ship and upgrade it that is. 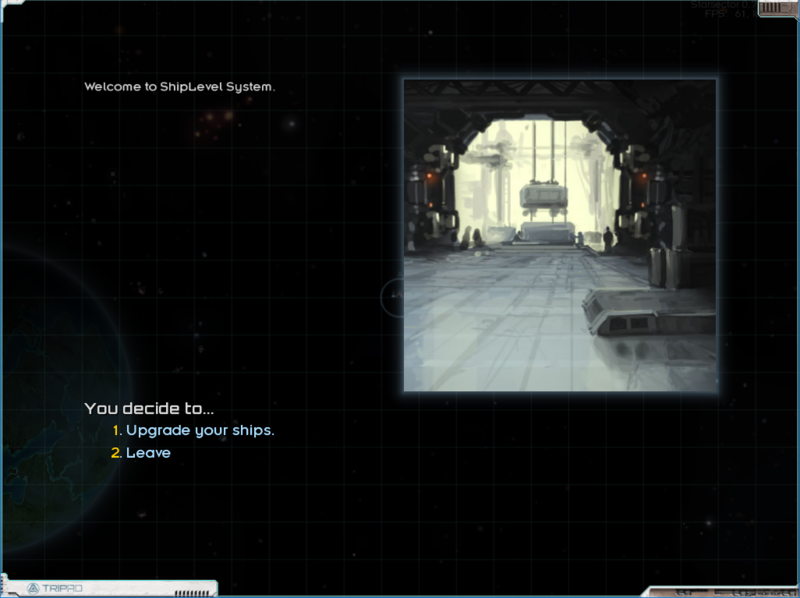 I suppose it would be simpler to just pay late game though, when you're swimming in millions of credits. Small improvement is almost not noticeable. 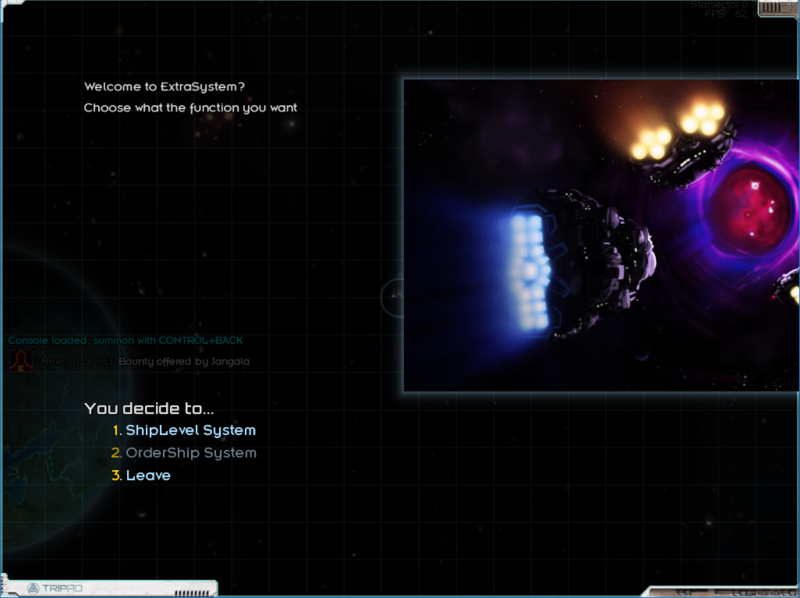 I meant added NPC fleet level. We will allow opportunity to meet fleet 10/25/50/*** levels of improvements. It can be specified in the name of fleet on similarity of types of fleet ("Mixed", "Assault" and other) in SS+. And still there was a wish that there was an opportunity to conduct improvement of the vessel being in storage menu. After 20+ levels the cost of improvement in resources the simply enormous. Or can be necessary to make improvement simply for money? P.S. I nevertheless am not enough the improved display of modifications. I seized the ship and learned that it is improved only when decided it to improve. Display of levels in a ship card is necessary. Also it would be desirable to know as far as each improvement influences. Great idea; definitely keeping an eye out on this one.